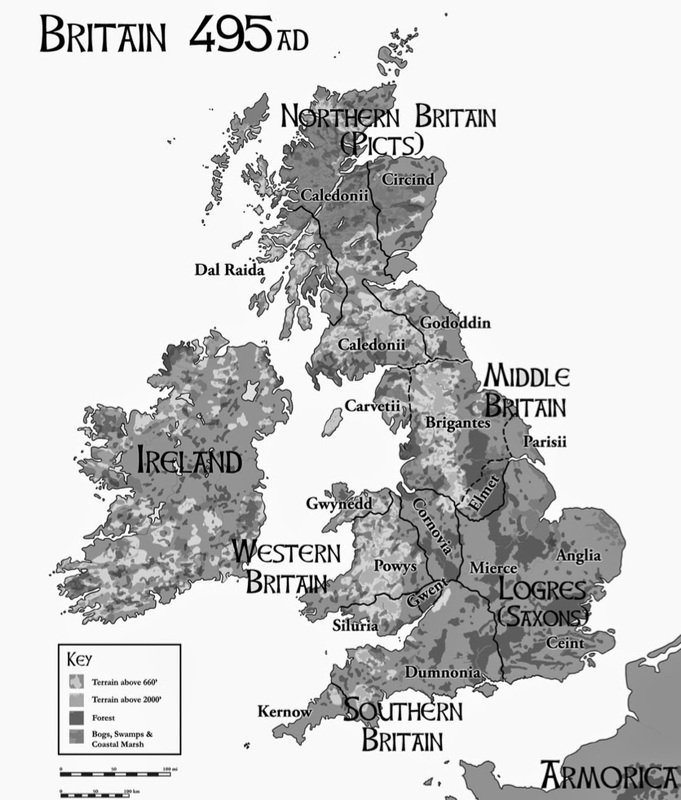 Akratic Wizardry: By Merlin’s tangled beard, Mythic Britain is here! By Merlin’s tangled beard, Mythic Britain is here! This is a really great product! Not only do you receive a wonderfully gritty and evocative historical fantasy setting (post-Roman Britain, circa 495), with special RQ6 rules for that setting (covering character creation, magic, religion, and so forth), but also a complete campaign consisting of seven adventures. My praise for the setting is based on first-hand experience. I joined Lawrence’s Toronto-based Mythic Britain campaign in late September. (The campaign already had been running for roughly a year before I returned to Toronto and was able to join. Consequently, I decided to make my character a Roman ‘outsider’ who had to ingratiate himself with an established band of Celts. This made for some very amusing role-playing!) The adventures that Lawrence designed do a superb job of immersing players in the setting. They are, moreover, quite novel, entertaining, and challenging. Of course, since I’m a friend of the author, you may be inclined to take my praise with a grain (or more) of salt. So here is a proper review of the book. Simply put, if you are looking for an Arthurian setting much grimier, bloodier, and darker than that found in Pendragon, then Mythic Britain is for you! This is on the wishlist...despite the fact I'm not playing RPGs at the moment and am trying to not buy any new books. How's it compare to Columbia Games' _Lionheart_, if you're familiar with that book? Sorry Allan, but I'm not familiar with Lionheart. You are missing out. But you cannot compare them at all as Lionheart is a campaign resource for Norman England, and thus well over 500 years after Mythic Britain. It is a great book that I use for Ivanhoe-style fun with Pendragon as a rule system. Shall we try to avoid an Outside Context Problem? Just in Time for Ragnarök!